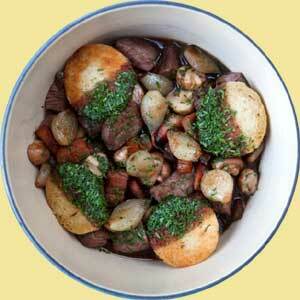 This recipe for Quick Beef Bourguignon comes from www.UKshallot.com. There is nothing quite like shallots for adding a uniquely delicate, sweet, piquant flavour. With their superior taste, shallots transform everyday meals into something extra special. Shallots form a vital part of the chef's mise en place and are at the heart of many classic dishes. Professional chefs and passionate home cooks know that shallots are a crucial ingredient in stews and casseroles but they are also fantastic in stir fries, breads, sauces, tarts, soups, salads and curries. Our traditional shallot growing areas cover 150 hectares (370 acres) of light, sandy soils in eastern England: principally, Cambridgeshire, Lincolnshire and Bedfordshire. The shallot growing year starts at the end of February in the UK, as soon as the soil starts to warm up and the shallots are harvested throughout July and August. Because shallots are a specialist crop, they require a great deal of care from sowing the seeds or plants to harvesting the bulbs and storing them. For this quick recipe it is probably best to make the sauce in advance so that on the day you can quickly cook the steaks and keep them rare if you like then finish the dish with the sauce. To make the sauce simply combine the stock, wine, tomato puree, carrot, garlic and thyme and any shallot trimmings you have into one large pan. Reduce the whole amount by three-quarters until you have the sauce consistency you require. Cut the bacon into lardons and place into a bowl. In a large pan add the butter and allow to get foaming hot, add all of the peeled shallots and bacon lardons and cook for 10 minutes on a medium heat setting. Add the mushrooms and cook for a further 2 to 3 minutes. Season with salt and pepper and pour in the finished red wine sauce, then put to one side. In a hot pan cook the diced steaks to your liking. Also at this point cook the croutons in hot olive oil until golden brown on both sides season with salt and drain on kitchen paper. Once the steaks are cooked add them to the hot sauce and check the dish for seasoning adjusting if necessary. Add the chopped parsley at the last minute. Finish with the cooked croutons that have been dipped into the hot sauce then into some of the chopped parsley.